Two-way ANOVA revealed significant effects of both Treatment Group (F[2,56] = 4.55, p < 0.02) and Drug (F[1,56] = 8.28, p < 0.01) on stereotypic activity (Figure 5). Figure 5. 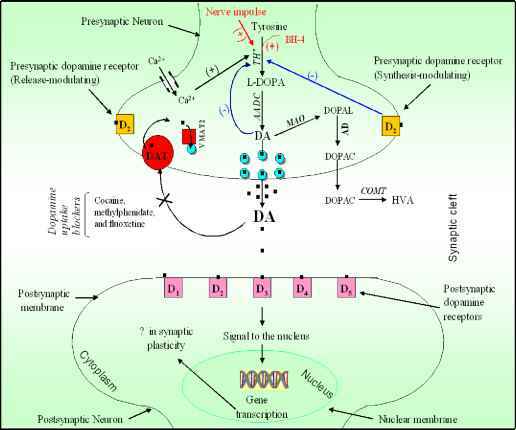 Effect of apomorphine on stereotypic movement in estradiol-exposed rats. Data are mean (+SEM) number stereotypic movements during 15 min of testing for groups of 8-11 animals. * p < 0.05 vs. Control group (collapsed across Drug condition). ** p < 0.05 vs. vehicle within Treatment Group. Post hoc analyses indicate that stereotypic movements in the E2 group were reduced when compared to the Control group (p = 0.015), and to a lesser extent when compared to E2/WD group (p = 0.078). 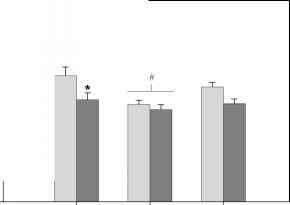 The effect of Drug was due to a significant apomorphine-induced reduction in stereotypic movement in the Control group (p = 0.01), with a trend toward an apomorphine effect in the E2/WD group (p = 0.075).